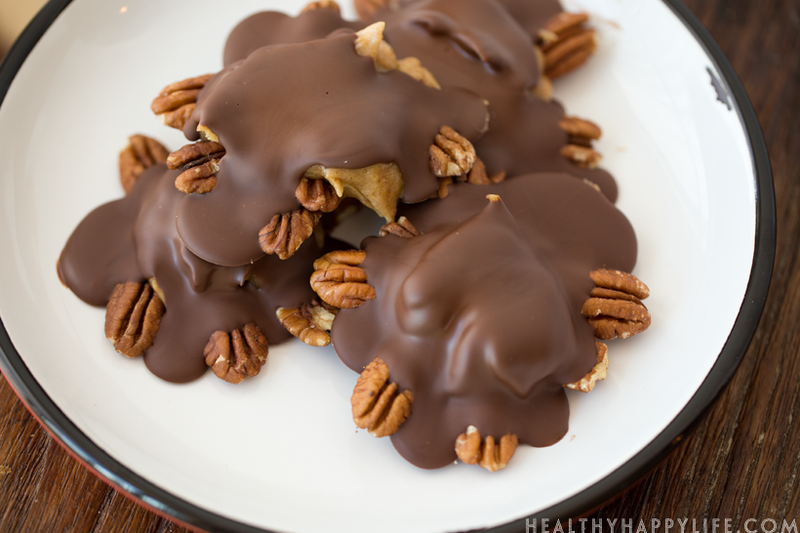 Today I veganize one of my favorite classic candy treats: Chocolate Turtles! 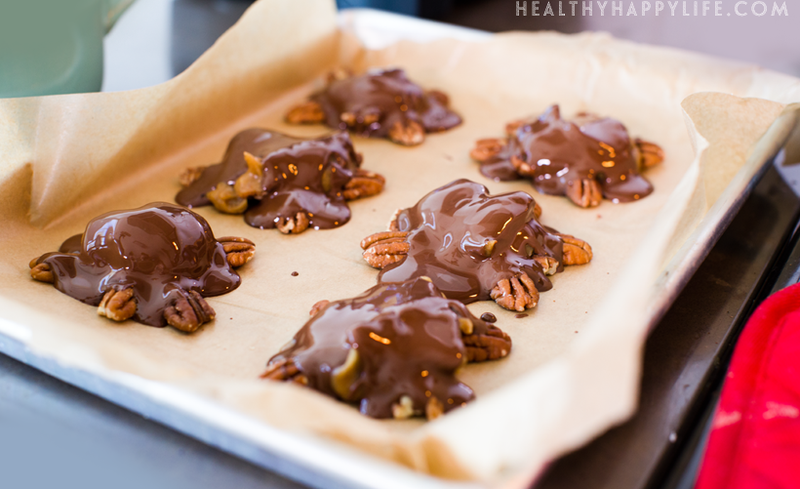 Crunchy raw pecans, gooey-rich coconut date caramel and velvety chocolate drizzled over top. Make these are feel like Willy Wonka. Plus watch my video to help you make these delicious, cutie, caramel-filled treats..
That means I do a few things..
Troll Halloween costume stores but rarely actually decide on a costume. Ponder said costume. And Halloween plans. Browse endless DIY costumes online and decide I will never be that fabric-ly crafty. Remember Halloween is on a Saturday so I have NO EXCUSE not to dress up and have fun. Remember I have tickets to Disneyland's Mickey's Halloween Party. Excitement ensues. Ponder costume. Must be Disney themed. Right? Evil Queen? Modern day princess? Hipster Ariel? Alison from Hocus Pocus? Braid + flowers = Rapunzel? Not a princess. I am 34. Not 5. Or do I slap on some Mickey ears and call it a day? Hm. Must. Get. Husband. To. Dress. Up. Too. 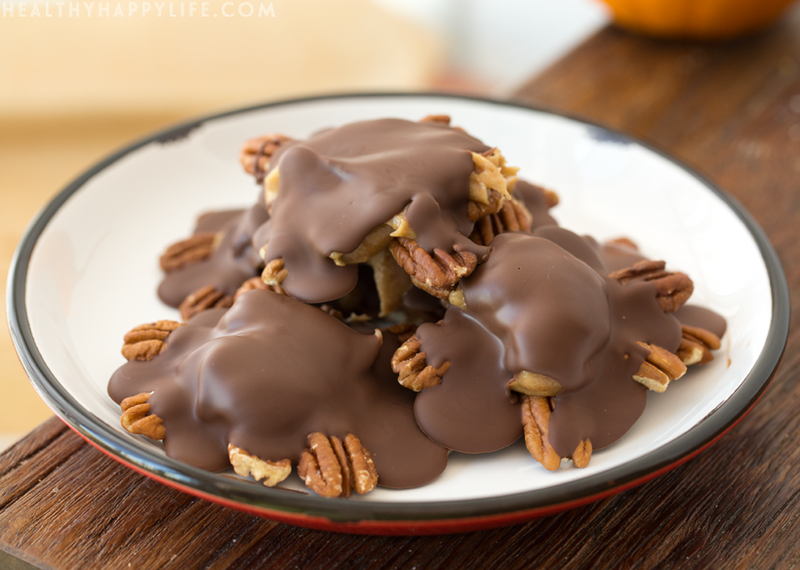 Pause on all Halloween thoughts and just make candy. 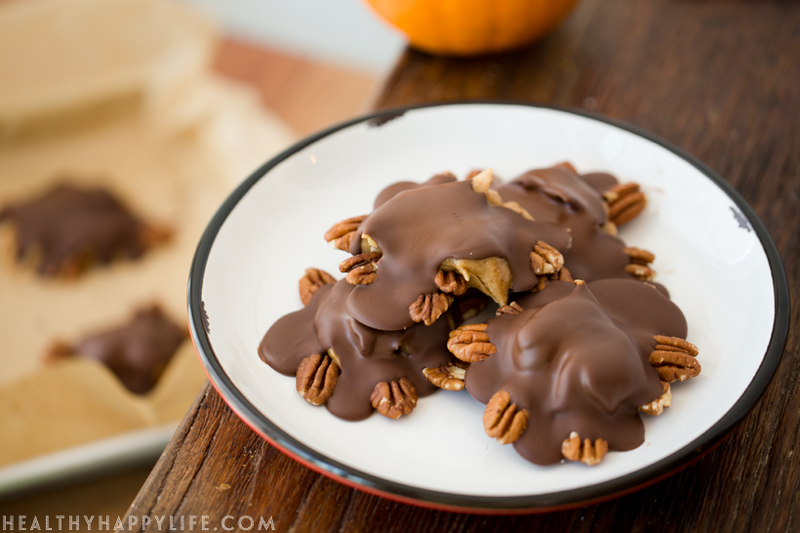 So what else could I possibly do on my Halloween Friday than make these chocolate turtles? Maybe make peanut butter cups. But today I wanted to try these guys out. And they came out so great! Jumbo sized and packed with flavor. I love them and hope you do too! I used the brand new super powerful, touchscreen enabled Vitamix 780 to blend the caramel. I love this machine! 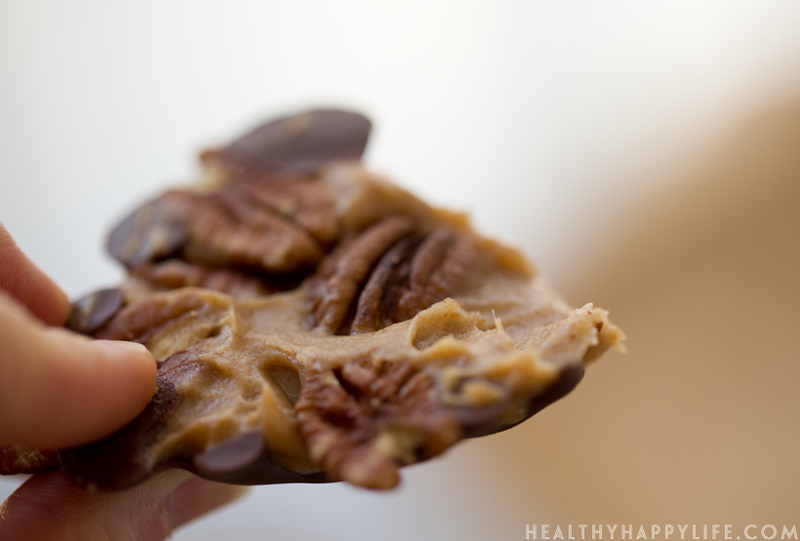 * Add a dollop of softened peanut or almond butter instead of or over top the caramel for a nutty twist! 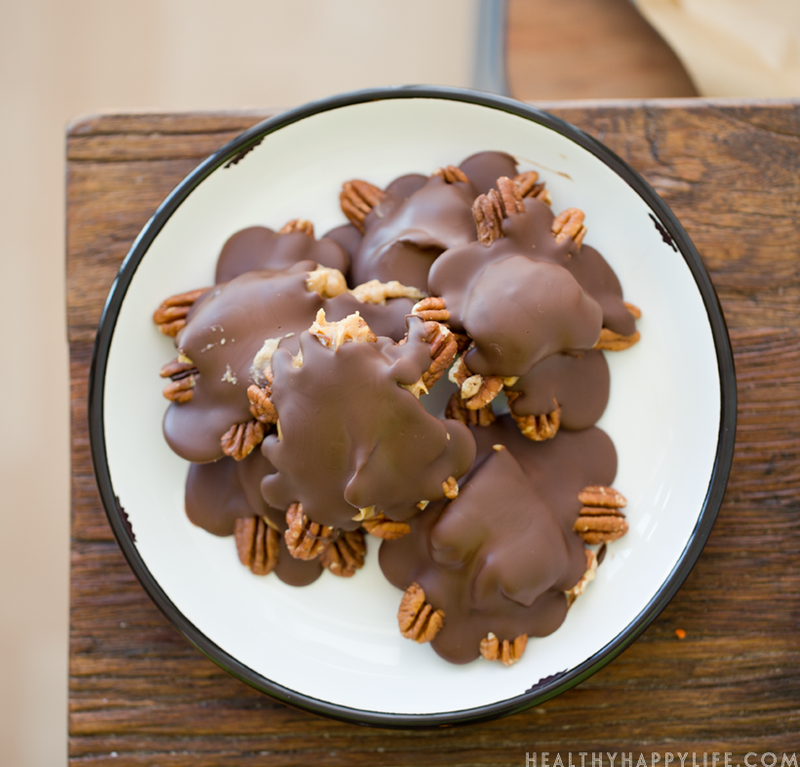 * Get super duper sticky-sweeter caramel by using my coconut milk + coconut sugar recipe instead. 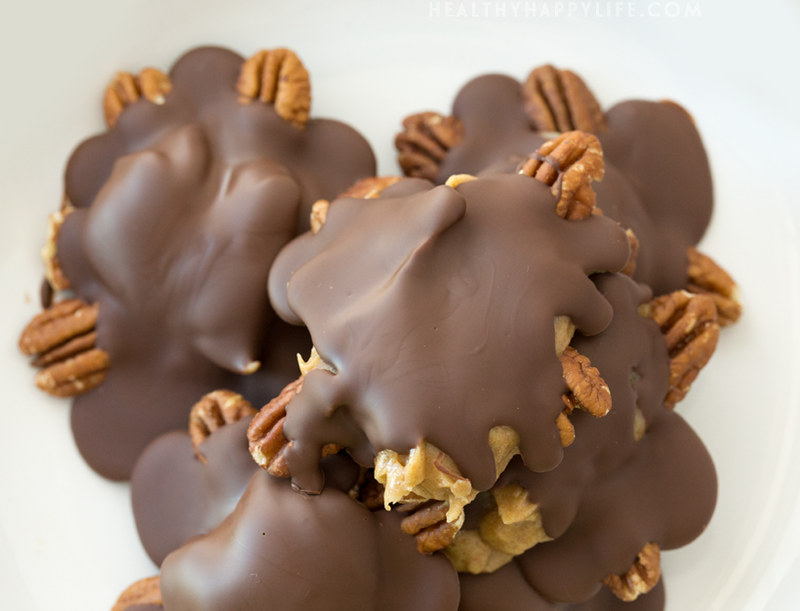 * Use raw walnuts in place of pecans for a walnutty twist! * Add a pinch of cayenne to the chocolate for some heat! * Add a sprinkle of coarse sea salt on top the turtle for sea-salted flavor. Video to help you make the recipe!.. 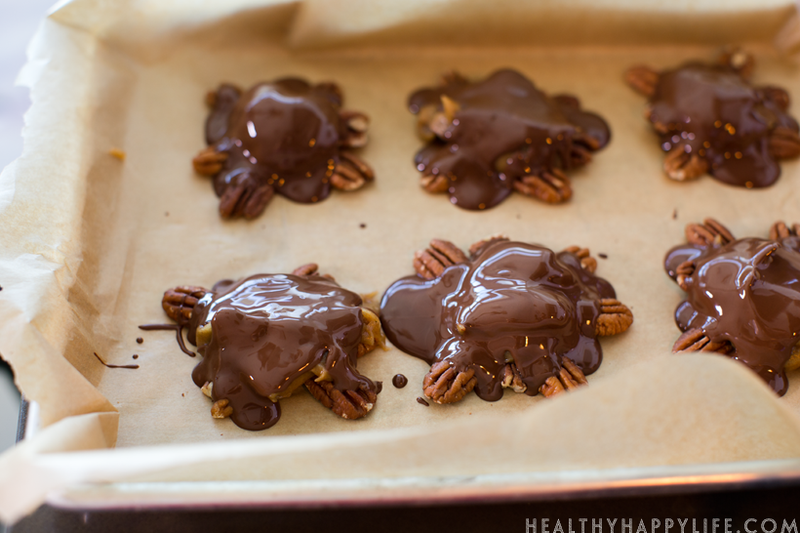 These extra gooey, totally amazing vegan chocolate turtles are made using salted Medjool date caramel, raw pecans and rich dark chocolate. Enjoy! Pit your dates. Soak them in warm water 2-3 minutes. Add all caramel ingredients to a high speed blender, including the soaked dates. Discard soaking water. 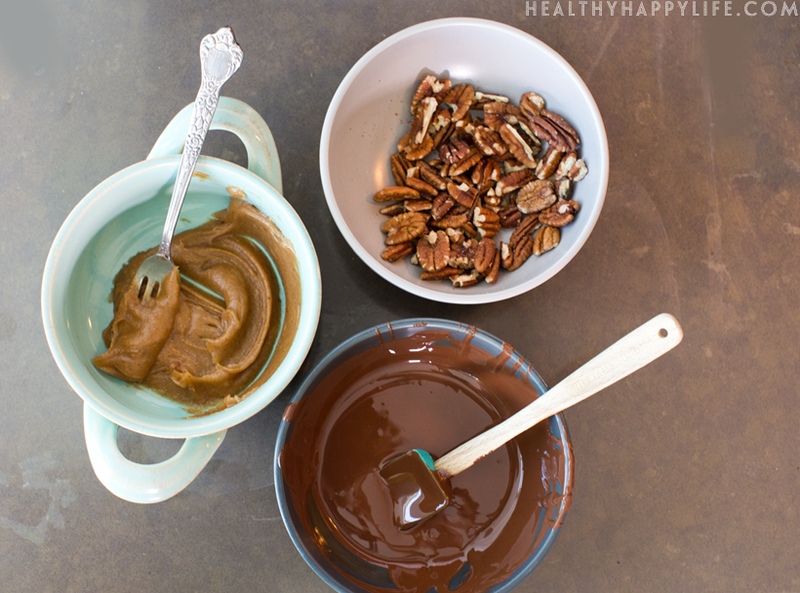 Blend the caramel until smooth. You will need to stop blender to scrape down sides a few times and use a tamper if using a Vitamix. Use the tall skinny container if you have one. When caramel is done, spoon it into a small bowl and place the bowl in the freezer to chill. Also place the baking sheet you will be using for the turtles in the freezer to get cold. Create a double broiled for melting you chocolate. 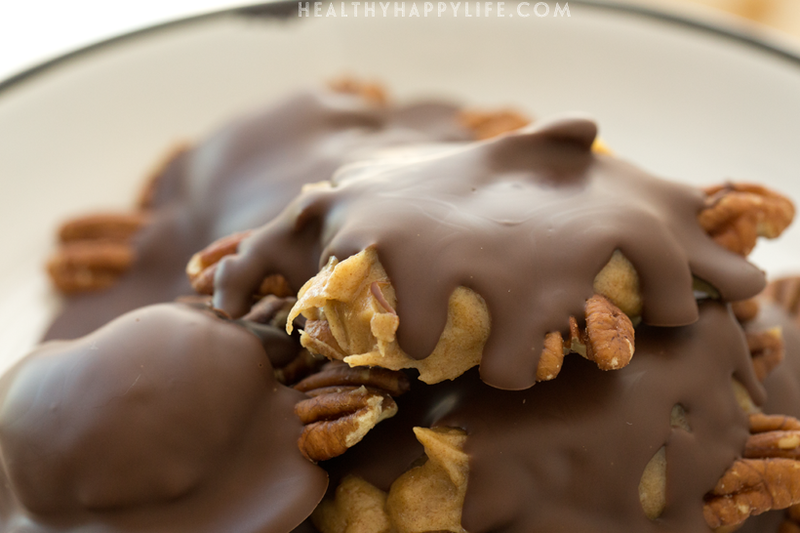 Melt chocolate until silky sooth. 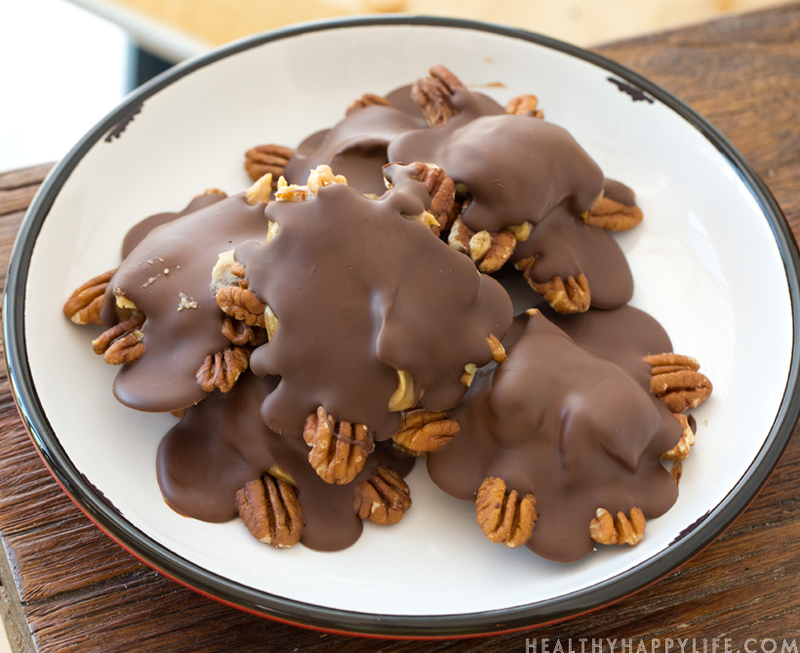 Pour chocolate into a small bowl and place that bowl in the freezer to cool a bit. Pull your baking sheet from the freezer and line it with parchment paper. 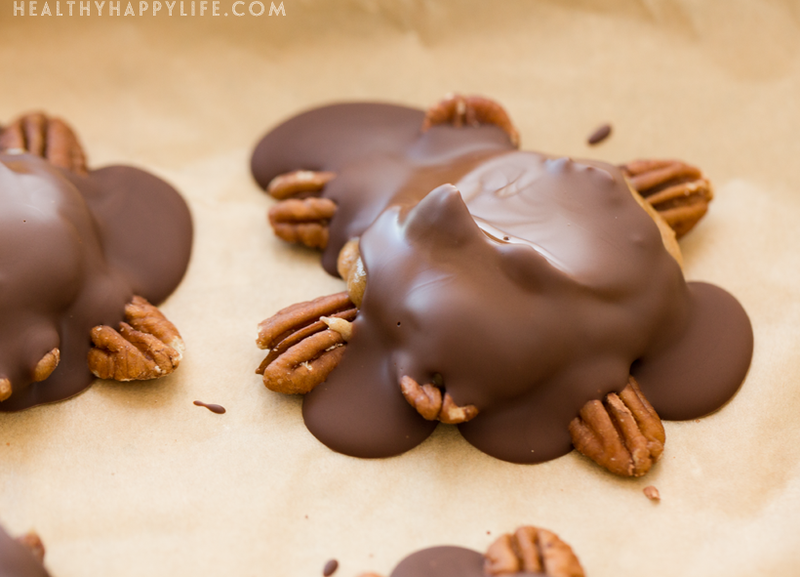 Pull the caramel and chocolate from the freezer as well and start assembling your turtles. 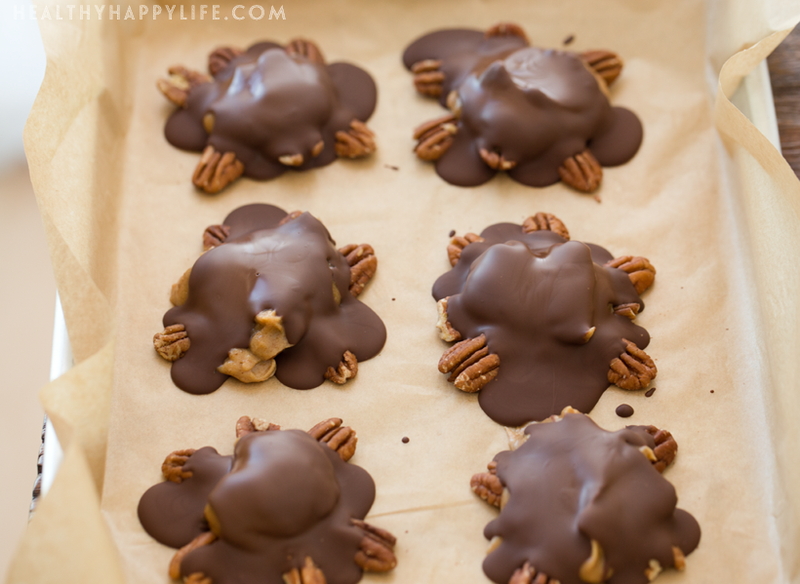 Create a turtle design with the pecans. 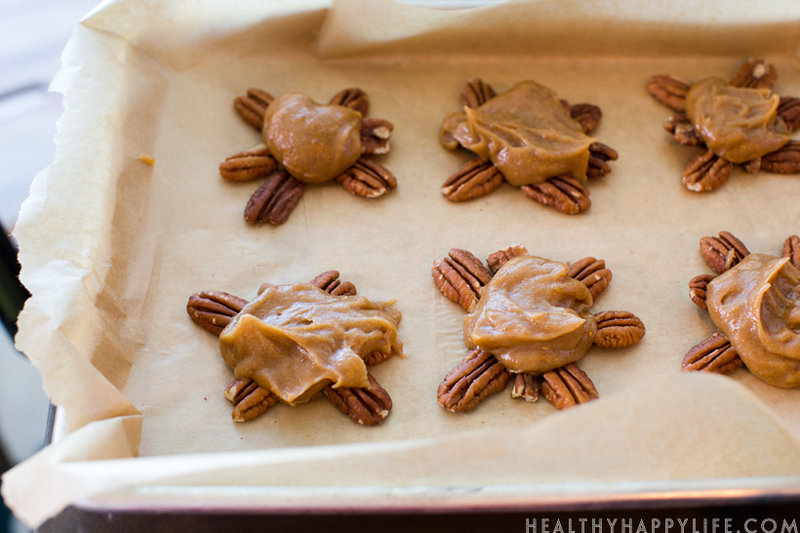 Then add a dollop of caramel to each turtle. Then top with a spoonful of chocolate. 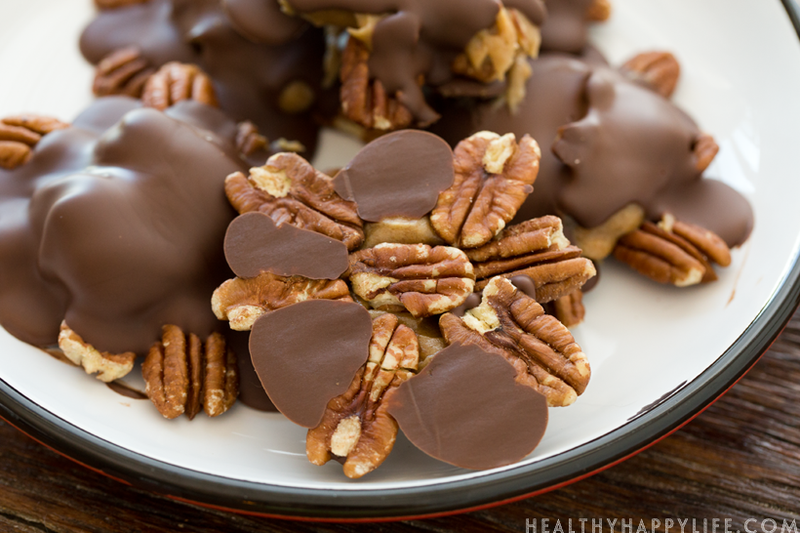 The cold caramel and cold pan will help so that the chocolate does not spread too far when poured. Continue until all turtle are done. 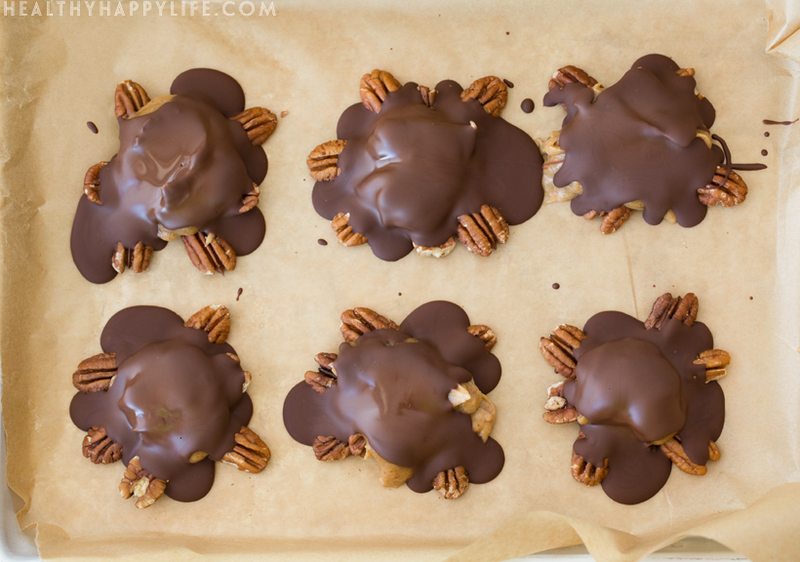 Note: If you are using a small baking pan -- you will probably need two pans for all your turtles. 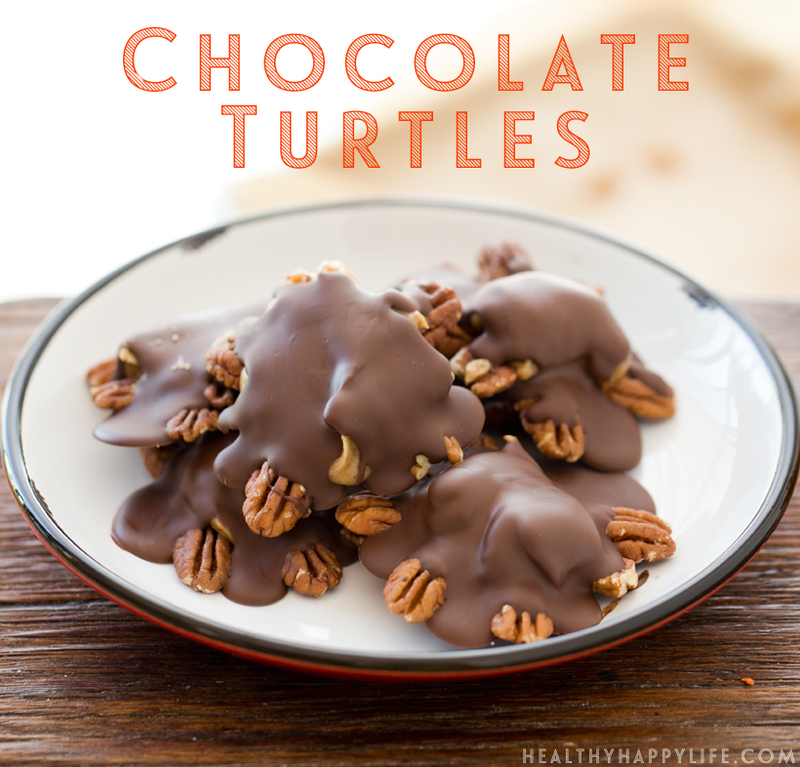 Place the turtles back in the freezer and in 5-15 minutes they will be fully hardened and ready to enjoy! Store leftover in the fridge or freezer. Last chance for Halloween Treats! 59 of them here! 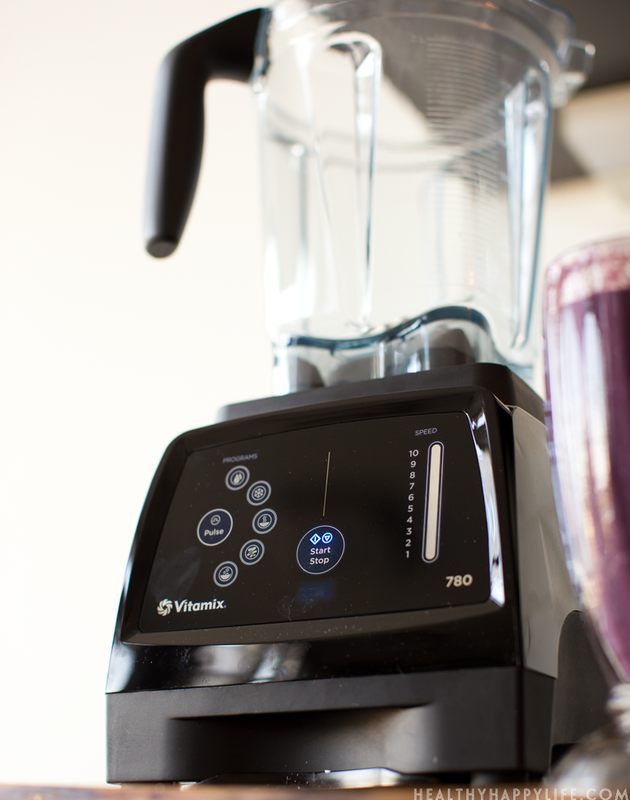 Disclosure: I am a Vitamix affiliate, but every word is because I LOVE these machines, the company, and believe in them for health and wellness!